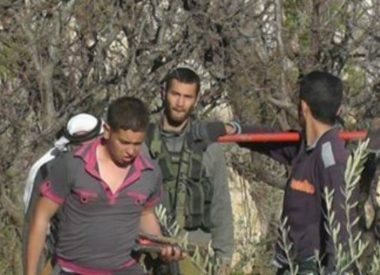 Israeli soldiers invaded, Monday, a Palestinian agricultural land, owned by a local farmer in Ein al-Qassis area, west of the al-Khader town, south of the West Bank city of Bethlehem, and forced a farmer along with his family out of their land. Salah stated that the land is 150 Dunams (37 Acres), and added that the soldiers and colonialist settlers have uprooted more than 400 olive saplings in that area, since the beginning of this year. Ein al-Qassis has been subject to frequent and escalating violations, starting several years ago, after the soldiers closed the roads leaving to it, and imposed severe restrictions on the farmers, in addition to repeatedly assaulting them. Israel is trying to control and illegally annex the remaining lands in the area for the construction and expansion of its illegal colonies.